The home improvement retailer has come a long way since 2012. Home Depot (NYSE:HD) stock has trounced the market and its chief rival over the last five years. Shares tripled, compared to a 160% jump for Lowe's (NYSE:LOW) and a 74% bounce for the S&P 500. Yet the home improvement giant is a different company than it was back in early 2012. Below, I'll highlight the key changes that could impact investors the most going forward. First and foremost, Home Depot is bigger. It logged $68 billion of revenue in fiscal 2010 and is now on track to pass $90 billion. Impressively, this stellar expansion came almost entirely through increased sales at existing locations. The company hasn't opened a new store in the U.S. market in the last three years, while Lowe's has been steadily adding square footage. Yet Home Depot has outpaced its rival thanks to surging comparable-store sales. Comps rose by 5% or better in each of the last three years, beating Lowe's by at least a full percentage point in each period. Shoppers may have noticed that Home Depot's aisles are more crowded, too. The retailer is handling 1.5 million transactions per year on roughly the same store base that it had in 2012 when the comparable number was 1.3 million. The retailer is turning a far greater portion of those sales into earnings. Net profit margin over the last year was 8% of sales, up from 5%. Home Depot trounces Lowe's on this metric, too, with double the profitability. Combine higher sales and surging margins and you get much higher earnings. Home Depot's annual profits passed $7 billion recently, more than twice 2011's result. In fact, the company now pays out more in dividends than it produced in total earnings in fiscal 2011. Home Depot's debt stands at $22 billion, up sharply from $9 billion in 2011. The retailer's debt-to-equity ratio is now above 300%, compared to just 40% back then. The increased liabilities aren't much of a worry to shareholders, though. Interest payments are still below 1% of sales and the company recently borrowed cash at its lowest rate on record. Meanwhile, management has made good use of the extra funds, primarily applying them to stock repurchases while plowing a big portion of earnings back into the business. The outstanding share count has slumped by 21% in the past five years as the company's return on invested capital has nearly doubled to 28%. Home Depot's addressable market is much bigger than it was just a few years ago. Part of that can be tied to the fact that the home improvement industry is on a serious upswing, jumping to a $700 billion annual pace from $390 billion. Yet Home Depot has made smart strategic moves that increase its sandbox as well. Through a big push into the professional side of the business, it has added access to a $120 billion market (compared to the consumer side and its $180 billion). Its recent purchase of Interline Brands tacked on another $50 billion potential market in maintenance, repair, and operations. Altogether, management sees their opportunity totaling around $550 billion, which should give the company plenty of room to expand over the coming years. CEO Craig Menear and his executive team are targeting over $100 billion in annual sales by 2018. 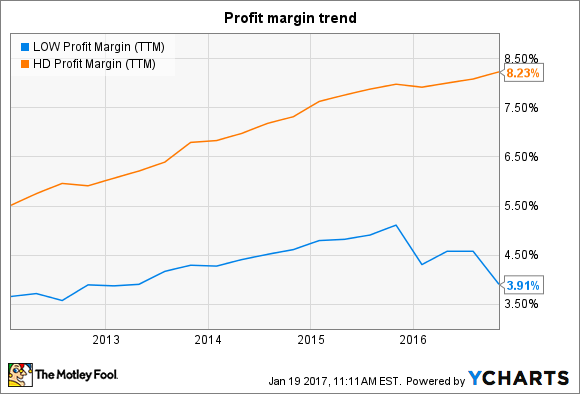 Operating margin should improve to 15% as well, they predict, so that Home Depot generates $15 billion of operating income to more than double its result from five years ago. Steady growth in the housing market will be key to achieving that result. So will more market-share gains and continued success on the e-commerce side of the business, which will likely jump to far more than its current 6% portion of overall revenue.